Violinist and Northern California native Andrea Segar is first violinist of the Lydian String Quartet, and Associate Professor of the Practice at Brandeis University. She has appeared as soloist with orchestras throughout the United States. Her performances have been featured on NPR’s Performance Today and classical music stations nationwide. Andrea's awards include first prizes in the Washington International String Competition and the ASTA National Solo Competition. Violinist and Northern California native Andrea Segar is first violinist of the Lydian String Quartet, and Associate Professor of the Practice at Brandeis University. She has appeared as soloist with orchestras throughout the United States. Her performances have been featured on NPR’s Performance Today and classical music stations nationwide. Andrea's awards include first prizes in the Washington International String Competition and the ASTA National Solo Competition. Her chamber music performances include collaborations with members of the Emerson String Quartet, Roger Tapping and Colin Carr. Andrea's festival appearances include Arizona Musicfest, the Olympic Music Festival, the Birdfoot Festival, the Perlman Music Program, Yellow Barn, Music@Menlo and various festivals in the UK and Mexico. She received her undergraduate and Master of Music degrees from the New England Conservatory, where she served as the teaching assistant to Donald Weilerstein. 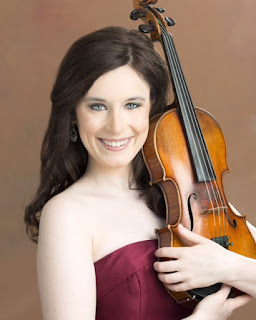 Andrea also served as the head violin studio teaching assistant to Soovin Kim and Philip Setzer at SUNY Stony Brook, where she received her Doctor of Musical Arts degree. She has served on the faculty of the Young Performers Program at Music@Menlo in Atherton, California, and on the faculty of the New England Conservatory Preparatory School. For more information about Andrea, please visit her website at www.andreasegar.comor follow her on Facebook at www.facebook.com/andreasegarviolin. Pianist Miles Graber received his musical training at the Juilliard School, where he studied with Anne Hull, Phyllis Kreuter, Hugh Aitken, and Louise Behrend. He has lived in the San Francisco Bay Area since 1971, where he has developed a wide reputation as an accompanist and collaborative pianist for instrumentalists and singers. He has performed with numerous solo artists, including Itzhak Perlman, Sarah Chang, Cho-Liang Lin, Camilla Wicks, Axel Strauss, and Mimi Stillman. Mr. Graber currently performs frequently with violinists Christina Mok and Mariya Borozina, flutists Gary Woodward and Amy Likar, and clarinettist Tom Rose. He is a member of the chamber groups Trio Concertino, MusicAEterna, and the Sor Ensemble. Miles and Arkadi Serper comprise the two-piano team Scorpio Duo.